The following are approximate tallies of current listings by county. These counts are based on entries in the National Register Information Database as of April 24, 2008 and new weekly listings posted since then on the National Register of Historic Places website since that time. There are frequent additions to the listings and occasional delistings and the counts here are approximate and not official. New entries are added to the official Register on a weekly basis. Also, the counts in this table exclude boundary increase and decrease listings which modify the area covered by an existing property or district and which carry a separate National Register reference number. The numbers of NRHP listings in each county are documented by tables in each of the individual county list-articles. 37°28′08″N 96°15′44″W﻿ / ﻿37.468753°N 96.262258°W﻿ / 37.468753; -96.262258﻿ (Elk County Courthouse) Howard Two-story yellow/buff-brick courthouse built in 1907. Designed by George E. McDonald with elements of Richardsonian Romanesque and Italian Renaissance Revival style. 37°48′22″N 100°20′56″W﻿ / ﻿37.806194°N 100.348889°W﻿ / 37.806194; -100.348889﻿ (Old Gray County Courthouse) Cimarron Location of the Battle of Cimarron in 1889. (#77000582) October 7, 2009 3rd and Whiting Sts. 39°35′20″N 95°36′44″W﻿ / ﻿39.58889°N 95.612222°W﻿ / 39.58889; -95.612222﻿ (Shedd and Marshall Store) Whiting Demolished September 2008-May 2009. (#02000609) April 16, 2013 200 E. 5th St.
(#100003427) 201 S. 4th St.
37°52′51″N 95°43′55″W﻿ / ﻿37.880833°N 95.731944°W﻿ / 37.880833; -95.731944﻿ (Stockbrands and Kemmerer Department Store) Yates Center Contributing site for the Yates Center Courthouse Square Historic District. 37°52′54″N 95°43′58″W﻿ / ﻿37.881667°N 95.732778°W﻿ / 37.881667; -95.732778﻿ (Woodson County Courthouse) Yates Center Contributing site for the Yates Center Courthouse Square Historic District. ^ The following sites are listed in multiple counties: County Line Bowstring (Cloud and Republic), Elk River Archeological District (Elk and Montgomery), Site No. JF00-072 (Republic and Washington), Site No. RH00-062 (Brown and Doniphan). ^ a b c d e f g h i j k l m n o p q r s t u v w x y z aa ab ac ad ae af ag ah ai aj ak al am an ao ap aq ar as at au Numbers represent an ordering by significant words. Various colorings, defined here, differentiate National Historic Landmarks and historic districts from other NRHP buildings, structures, sites or objects. ^ a b c d e f g h i j k l m n o p q r s t u v w x y z aa ab ac ad ae af ag ah ai aj ak al am an The eight-digit number below each date is the number assigned to each location in the National Register Information System database, which can be viewed by clicking the number. ^ Location derived from its NRHP nomination form; the NRIS lists the site as "Address Restricted"
^ Location derived from its NRHP nomination form; the NRIS lists the site as "Address Restricted". ^ "A rich history..." Hodgeman County, KS. Retrieved 2016-04-03. ^ "National and State Registers of Historic Places: Jewell County". Kansas Historical Society. Retrieved 2014-09-08. ^ "Points of Interest". Burr Oak, Kansas website. Retrieved 2014-09-08. ^ The Jewell County Jail's location is incorrectly represented in the National Register of Historic Places nominating form. The building as actually at the southwest corner of Center and Madison: see photo including street sign, noting direction of shadows. ^ Kiowa County National Register properties, Kansas State Historical Society, 2009. Accessed 2009-03-09. ^ See 2014 photo showing museum sign at lower right. ^ Bridge moved to Prairie Dog Golf Course in 2006: see Norton Telegram, 2007-01-09, p. 3; retrieved 2014-09-21; and "National Register of Historic Places Registration Form: Amendment", retrieved 2014-09-21. ^ See September 2014 photos of beam bridge at Commons:Category:Sand Creek bridge, County Road Y, Norton County, Kansas. Uglybridges.com gives a date of 2010 for the current bridge. ^ Wedel, Waldo. "Minneapolis 1: A Prehistoric Village Site in Ottawa County, Kansas". Nebraska History Magazine 15.3 (1934): 210-238: 222. ^ Roper, Donna C. "The Whiteford Family of Salina". 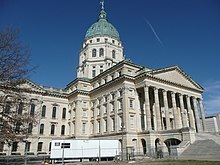 Kansas History 25.4 (2002): 244-257: 247. ^ See photos taken 2014-09-14. ^ See 2016 photo of box culvert at location given in NRHP nominating form. ^ "Rush County Line Bridge". Bridgehunter.com. Retrieved September 25, 2015. ^ Location derived from this Kansas University webpage; the NRIS lists the site as "Address Restricted"
Wikimedia Commons has media related to National Register of Historic Places in Kansas. This page was last edited on 3 April 2019, at 08:44 (UTC).